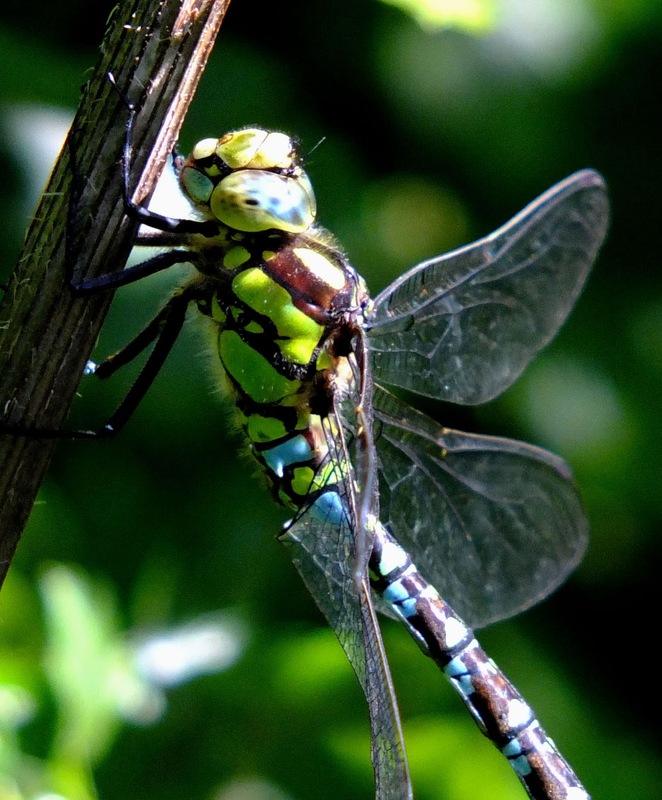 Dragonflies, one of the oldest inhabitants of this planet. 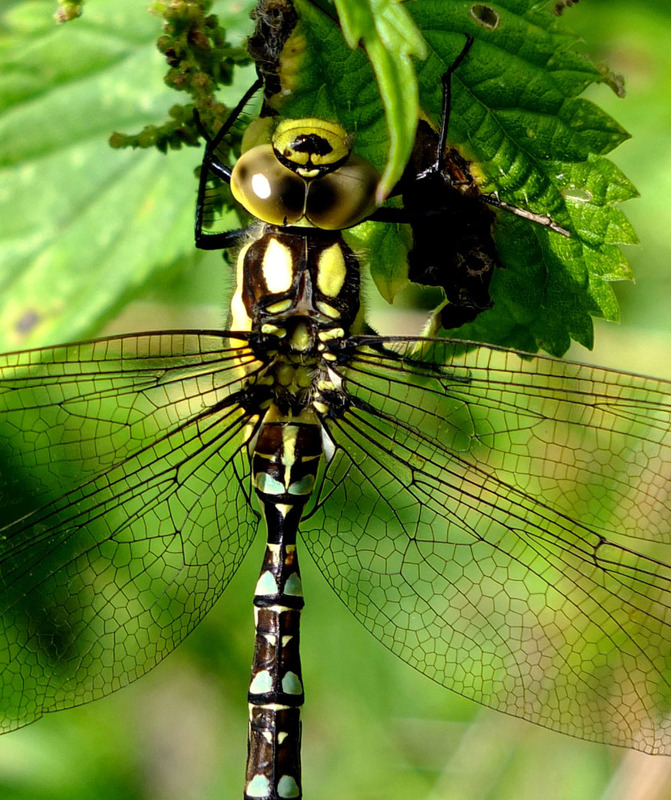 Masters of the air and top insect predator, around 50 species are found in Britain; in County Durham less than 20. Creatures of the summer and best sought on calm sunny days, join me as I hunt them with my camera, trying to get the best pics possible and record all variations and behaviour, and enjoy the birds and wildlife as I seek them out on my local patch and beyond. Just to wish a Happy New Year to all readers of The Dragonhunter Diaries. 2016 ends and 2017 begins; a new year, a new start. Having upped sticks and moved house just before Christmas, I'm making a new start meself, so Dragonhunter Diaries finally comes to an end after six glorious years. 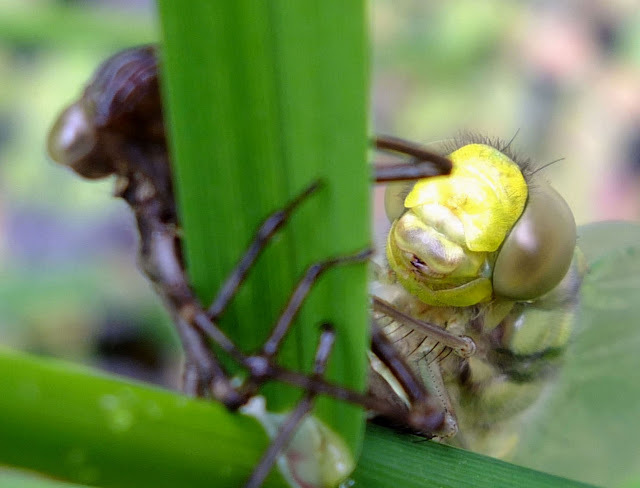 I haven't moved too far so will still visit some of my old haunts, but I'll be seeking out new regular sites to watch; the likes of Burdon Moor and Kibblesworth will be easier to get to so aim to spend more time getting better acquainted with their Odonata rather than just an annual visit. So a big Thanks to all for looking in, reading and commenting; I'll post a link to my new blogsite here when it's up and running. 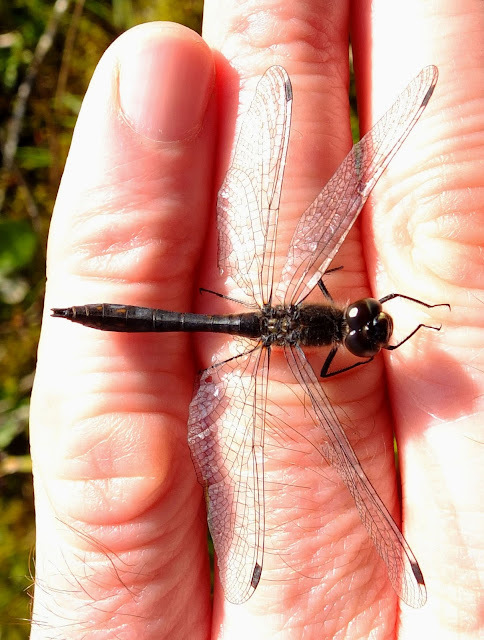 The good weather continued into early October, enabling me to carry out one final mission, to find a Gateshead Black Darter at Stargate Ponds. A visit on the 3rd came up trumps, with 4 males and a female, and 30+ common darters being not far off a best count of the year. to get close enough for a photo on the boggy ground. That indeed proved to be the last hunt of the late summer sun, as temperatures plummeted soon after, but a good day out to finish the season. Afterwards just a few snatched visits to Far Pasture on the odd sunny day where, with autumn now well and truly kicking in, I took my final pictures on the 17th. Stragglers hung on at Far Pasture and Shibdon, with Migrant Hawkers being reported almost to the end of the month, but I wasn't able to get out any more so that was the end of the Dragon Hunting Season for me for 2016. My original shot, it only settled long enough for one click of the camera, so not bad considering. A warm spring had meant early damsels, but June was a washout and summer months only gave us sporadic periods of decent weather. Combined with my own inability to get out very often this meant it was a mainly forgettable season. Like last year, the late season sunshine was a much-needed bonus, but sadly it didn't last into November like 2015 had. Of my local sites, Far Pasture gave me the worst year I can remember. The Forbidden Pond was barren after its 'clean-up' last winter, the Chaser Pond I'll never know if it was as good as last year as the resident Jersey family put me off investigating it, and there was hardly a dragon or damsel to be seen on the main pond. The roadside was good for early damsels, but even these were few in number. 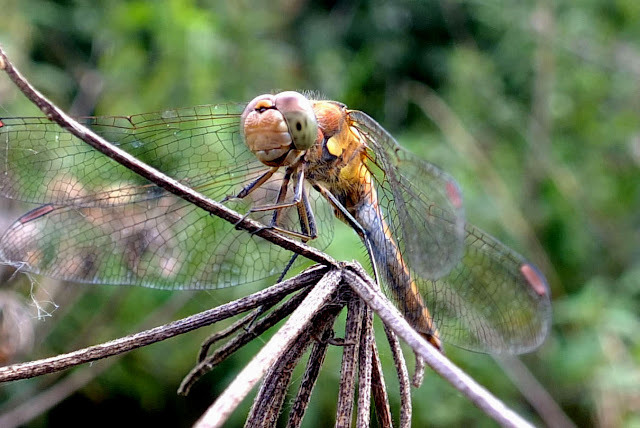 No chasers, no Ruddy Darter for the first time since recording began, very low numbers of Common Darter and below average numbers of late-season Hawkers. All-in-all, a measly 2 out of 10. Thornley Woods Pond was excellent early season, with emerging red damsels kicking us off in early May and a record number of Southern Hawkers emerging in late June and early July. However, visits during August and September revealed very few damsels of any description, and even fewer adult hawkers, a bitter disappointment as I didn't witness a single ovipositing female. 6 out of 10 for a season of two halves. The River Derwent was another big disappointment with very few Banded Demoiselles being sighted despite many attempts to catch up with them and good numbers being reported from other local rivers, ie the Teams and the Wear. 2 out of 10, just hope it improves next year. Gibside is a bit difficult to evaluate, as the couple of visits I did manage came up trumps with early season damsels and especially the Emeralds in early July. However I just wasn't able to get there at the times I wanted, and visits with the family were generally on overcast days. The Walled garden Pond was a disappointment, I hoped to catch a Ruddy Darter here as I have done in past years, but apart from a couple of red damsels there wasn't a dragon to be seen. 7 out of 10 for damsels, 0 out of 10 for dragons. My one visit to Kibblesworth saw me dipping on my target species of Black-tailed Skimmer, another poor day overall rescued only by a couple of Emperors. 1 out of 10 (for the Emperors). Shibdon Pond; not a site I visit with any regularity but late season Migrant Hawkers have become a highlight of the calendar. This year I got exceptional views and photos of a pair in a mating wheel, THE highlight of the season, so a mighty 8 out of 10 for this site. One site which didn't let me down this year was Stargate. 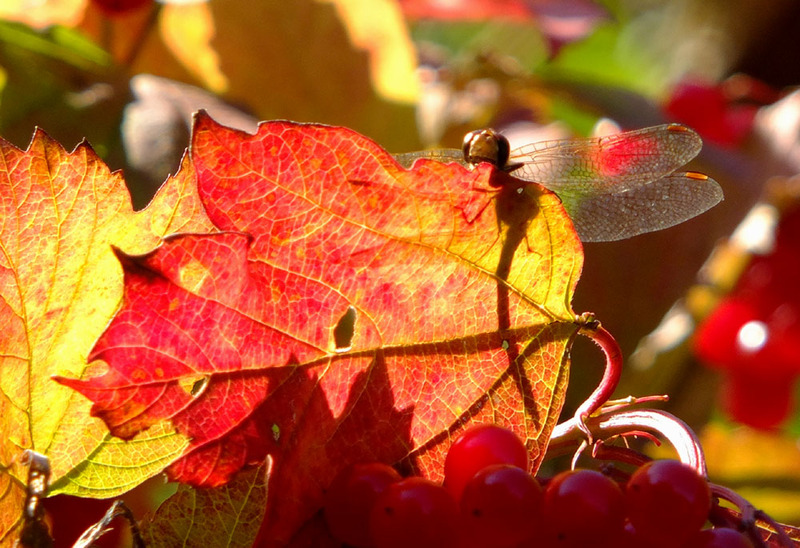 Two visits, one early season for the chasers, and one late season for Black Darters, were both excellent days out for numbers of dragonflies present, photographs taken and entertainment. 9 out of 10, I really should visit here more often. By next spring I'm hoping to have moved on to a new patch, I do hope so as I really need a change of venue and the challenge of exploring new sites. The valley is becoming a bit stale with my most frequented sites not producing the goods in the last couple of years. Hopefully a good summer weather-wise is all that's needed, but Far Pasture will take a few years to recover from the Forbidden Pond being cleaned out, and Thornley woods Pond is in a bit of a state; emergent grasses are taking over, the pond itself is full of leaf litter (unavoidable in the middle of a woodland) meaning it's devoid of aquatic plants, and the water is teeming with Sticklebacks, enemy of all aquatic larvae and tadpoles. The future don't look too bright. 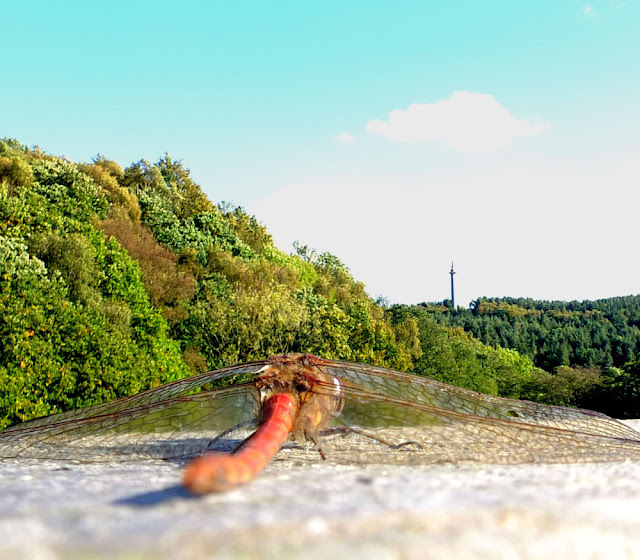 The month of August was a continuation of hit and miss weather, lacking in worthwhile opportunities and generally a lack of dragonflies everywhere. The school holidays means I'm always scrapping for quality time in the field, and as usual, our annual family outing to Cragside was the highlight of the month, with nothing much to be found on regular short visits to Far Pasture or Thornley woods Pond, the latter being particularly disappointing after the excellent early season there; the hawkers which emerged hardly made an appearance on the days I could get there, with just a few Common Darters and a handful of damsels, numbers well down for both on previous years. Darter numbers were also very low at Far Pasture, with no sightings of Ruddy Darter at all, though as it was early September last year before the first one appeared I wasn't too worried yet. Migrant Hawkers too were noticeable by their absence, usually appearing by the 10th, but again, not a single sighting during August, only Southern Hawkers posing for photographs occasionally at the top of the access road. I also tried many sites for Golden-ringed Dragonfly on family days out without success, just wasn't my year (again). Note the more pastel colouring mix of pale blue and yellow, a lovely specimen. 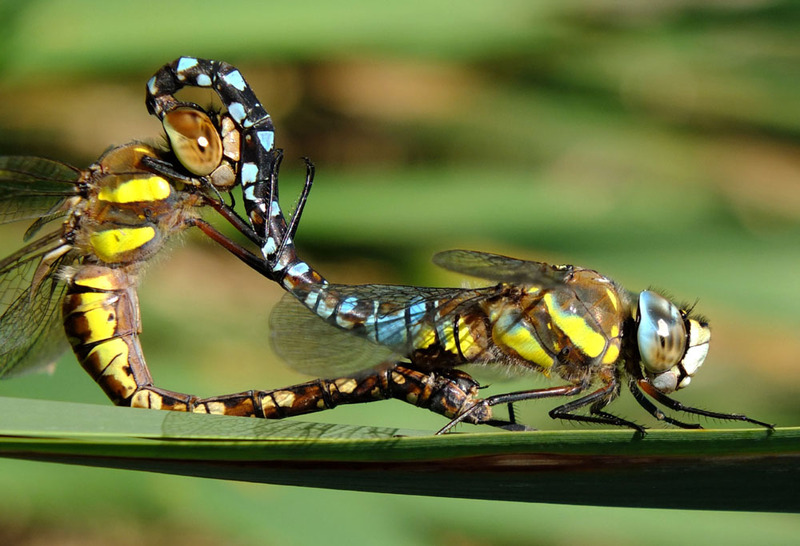 this the best of the Black Darter pics on the day. 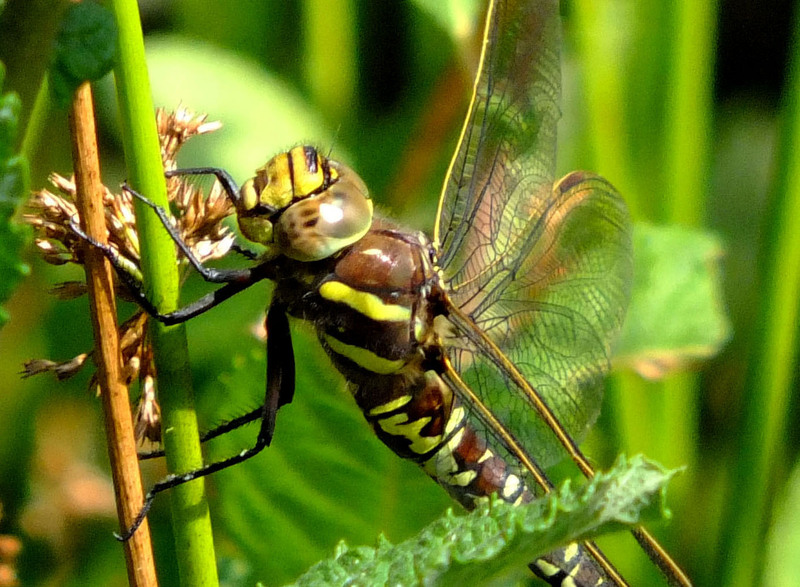 Star Dragon at Cragside was this female Moorland Hawker. Into September and much the same. With the kids back at school I gleaned every opportunity to get some late summer action, but like August, Thornley Woods Pond and Far Pasture were a dragonfly disappointment. I spent many an afternoon trying to find a Ruddy Darter at Far Pasture to no avail, so unbelievably dipped this species for 2016, the first year I can remember doing so since I found my first at Far Pasture back in 2006. Male Migrant Hawker, quite distant so pleased how this one turned out. Until then I'd only ever photographed one female of the species before, and though I'd seen many a mating wheel this was the first I'd been able to study in close-up, so even in this less than average year, another new experience was gained, and another gap filled in the album. 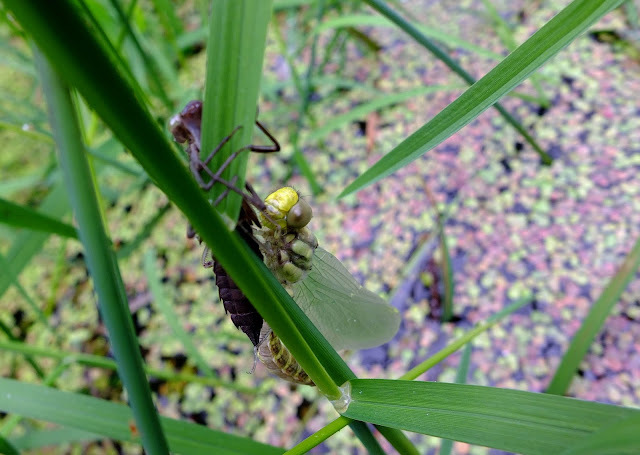 July began in much the same way June had ended, with more Southern Hawker emergence at Thornley Woods Pond on the 2nd, this time I recorded 7 individuals including one which was emerging right next to the boardwalk presenting a fantastic photo opportunity. 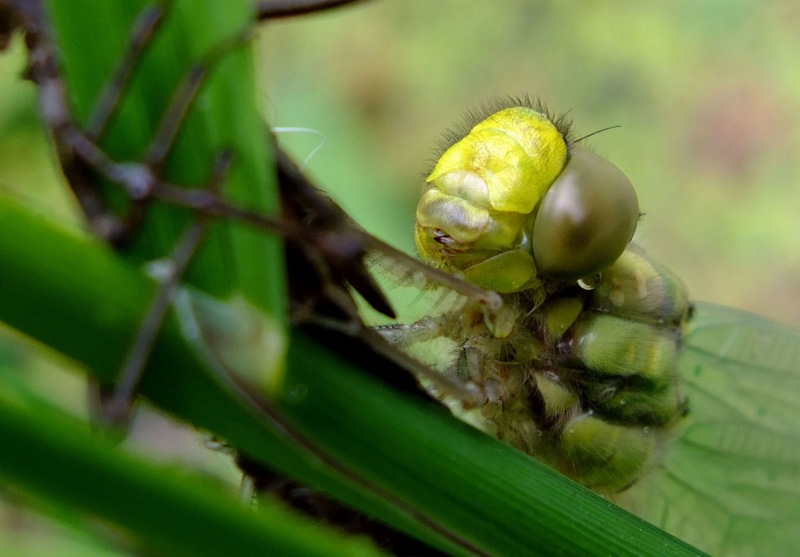 Southern Hawker emerging, a wondrous sight. Thought I was doing well to get this close . . .
until I saw the next one. More were noted through the week making a total upward of 30 hawkers this year, a really good count considering the lack of action here the last couple of years. On the 10th a delayed trip to Gibside thanks to the hitty-miss weather again, the target this time being Emerald Damselfly; the Lily Pond is always a great place to catch emergence early July, and though I have yet to find one actually emerging, the long grasses around the pond plays host to many an immature or teneral individual. And so proved to be the case again, giving some cracking photo-opportunities from a species which tends to be less nervy than other damsels, and will usually put up with the intrusion of a close camera. 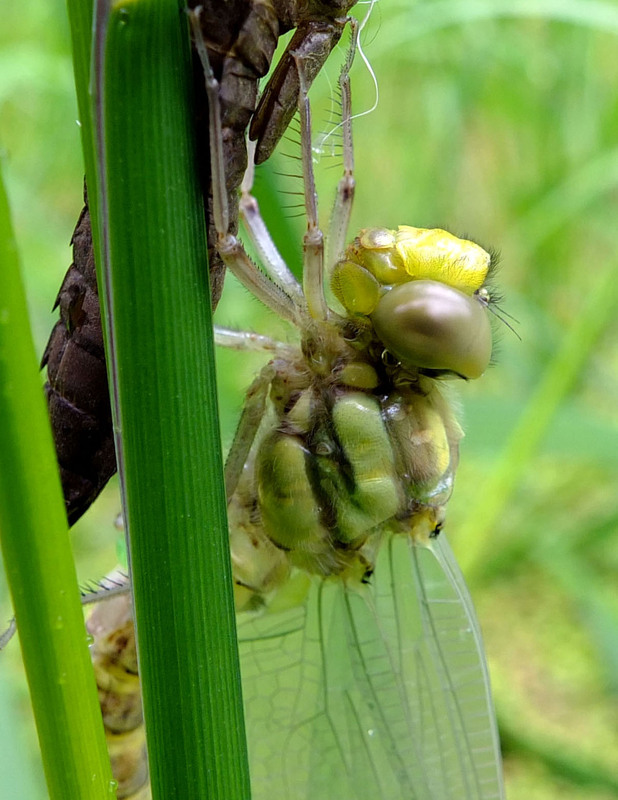 Biggest disappointment of the month was my trip to Kibblesworth for Black-tailed Skimmer. I didn't get there last year due to the weather, and this year was looking bad for the same reason. I chose to go on Wednesday 13th as a mix of cloud and sunny intervals was about the best I could hope for in the week before the schools broke-up. In the event I wish I hadn't bothered. Two twenty-minute periods of sunshine either side of an hour of cloud and then rain, was all I got for Dragonhunting. 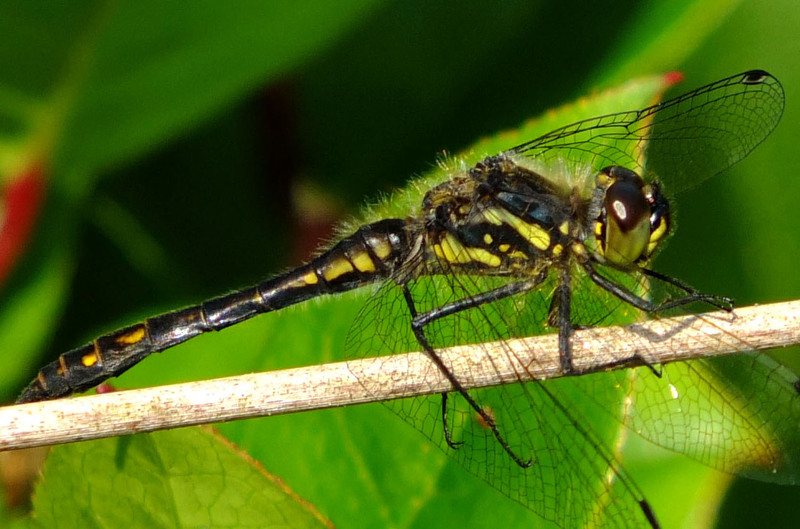 No Black-tailed Skimmers (third year running I've missed out). A couple of Emperors were nice to see but never close enough to photograph, indeed I didn't get any photographs on the day worth posting. Lamesley road bridge also drew a blank for Banded Demoiselles, despite up to 20 having been sighted in the area just recently. All in all a miserable day. less than successful sortie along the valley on the 6th. A hot and sunny 19th improved my mood, though the day started badly when once again Banded Demoiselles were conspicuous by their absence at HaggHill, but later at Lockhaugh meadows two females provided good entertainment and some lovely photos. Shame there were no males to be seen this year but it's been such a bad year for them I was more than happy with those two. Female Demoiselle on the Derwent awaits her lunch. And that I'm afraid was my lot for the month of July. School holidays, mixed weather and life in general meant it just wasn't going to be easy this year. The last few weeks has seen an invasion along the east coast of Britain by my favourite bird, the Waxwing. A mass of some 300 birds gathered in Whickham across the valley. They'd been there well over a week by last Friday but for one reason or another I hadn't been able to get across to see the glorious sight for myself. On Friday (11th) I had a few hours put aside, but in the morning saw a tweet (on Twitter) about a group of 30 or so waxies at Victoria Garesfield, nearer and in walking distance, so opted to try and find those rather than take two buses to Whickham and two back. 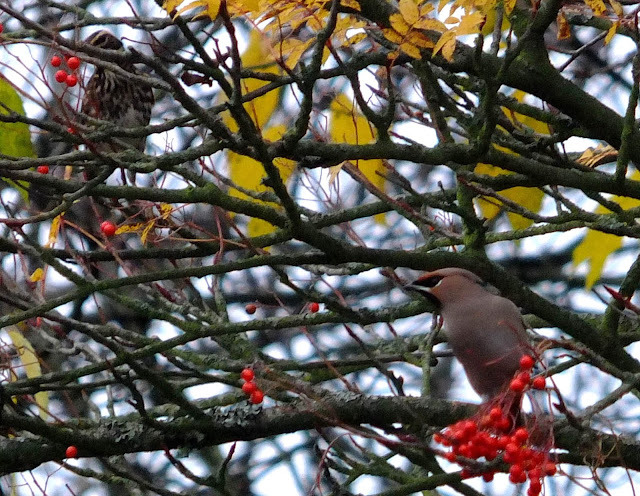 A pleasant 35 minute walk and I was at St. Patrick's Cemetery, an area bursting with berries, bursting with Redwings, but despite a thorough search of over an hour; no Waxwings. Defeated, I made my way home, thinking what a great area it was despite my failure, with action from kites, buzzards and sparrowhawks, and a host of smaller birds. 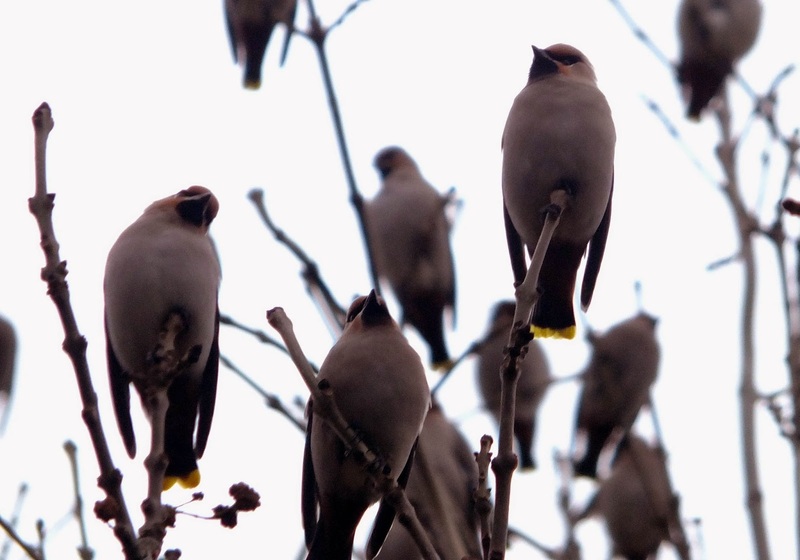 But as I walked back down the bank along the main road through Highfield, I heard a familiar jingling sound in the air as a small flock of maybe 12 Waxwings glided over my head from behind, low and slow for unmistakeable views. Gettin! I thought, as they circled me twice then split; most of them headed off over the houses but three alighted in the top of a tall tree by the road. I watched them for a short while then risked getting the camera out (hate doing that in populated areas, feel a bit pervy) and managed just two shots of one bird before they were off, and that was the last I saw of them. First Waxwing of the autumn for me, high up in Highfield. Buoyed by that success, on Saturday (12th) I had a good look around the popular hotspots of Blaydon, and Winlaton, and my own village, but drew a complete blank, though noted there's a veritable feast of a berry buffet laid on ready for the next wave of waxies to arrive. On Sunday and Monday I checked the tree opposite the Derwent View Clerb again in the village; like everywhere else, it's bursting with berries ripe for the taking, just a matter of time. On Tuesday I had the chance to go to Whickham as my better half was picking up Sprog1 from school. I knew the waxy site was all but depleted now but checked with Rob who informed me there were still some in the area so off I went. Sprog1 and his mate wanted to see them too so I took them round to where they'd been, but were there no more, obviously flown to the new feeding site wherever that was, so Sprog1 suffered his first dip (there'll be plenty more son, don't worry). 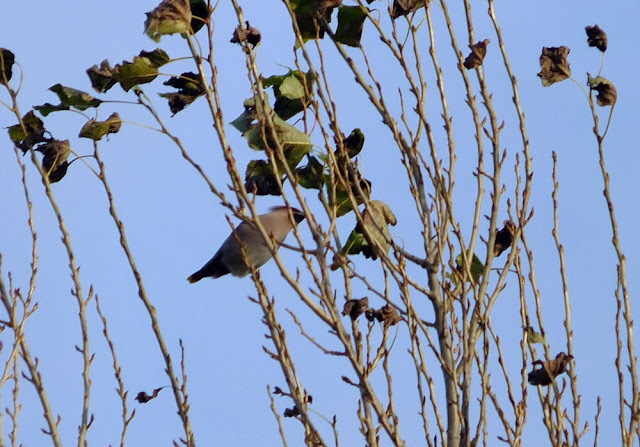 We drove back a different way so I couldn't check the Clerb tree again, and then was out all day yesterday, so this morning I took to the shops with the intent of checking it out, and from the main road I could see waxwings in the tall tree next to the rowan way before I got anywhere near the Club. Typically I hadn't taken my camera (even though I had toyed with the idea) so did my shopping as fast I could, headed home, put the sighting on Twitter, then headed back down with my camera. interesting poses showing a (edit) diagnostic feature of immature (top)and mature (bottom) individuals. Note the broad yellow tips to the dark wing primaries on the mature bird, indistinctive in the immature. Size of the crest is probably best feature to distinguish sexes in the field, the males being much larger. Ron however got some crackers, so keep an eye out on his blog (linked right), and it was good to catch up with him again, great photographer, smashing bloke. It was also great just to watch the waxies for a while, their busy feeding, occasional flycatching, sentry-like stance at rest, and that wonderful jingling sound they emit.